Rainbow Riches Win Big Shindig has the same looks as the original Rainbow Riches but the gameplay is very different, for starters this was firstly released as an online slot and then added to Barcrest's 777 Cabinet. This was also one of Barcrest's first community based games, when 2 or more games are linked together and one player gets the wishing well feature the other active players are also eligible for a win, even though they're playing a completely different machine! 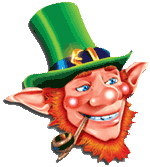 The main feature on this machine is the Leprechaun hat 'pick me' bonus, if the hats appear on reels 1, 3 & 5 the player is asked to choose one of them, inside 2 of the hats are cash amounts but under the 3rd will be a leprechaun, choosing this hat will award a pot style feature... The pots feature awards a bronze, silver or gold win ranging from £40 upto £500!